The iPad is something that I have wanted for many years now. Not the actual Apple product per se but a light and straight forward device (Instant ON, Palm OS-like One Touch Access) for some simple computing, checking email, browsing web and instant messaging as well as a battery life that allows you to leave the charger at the hotel room for the day. From the Psion, to the Palm, to the Visor Platinum, to the Sony Clie, to the WinCE notebook. I've tried them all but none could give me the perfect fit to my requirement. I was ahead of my time. By a decade. 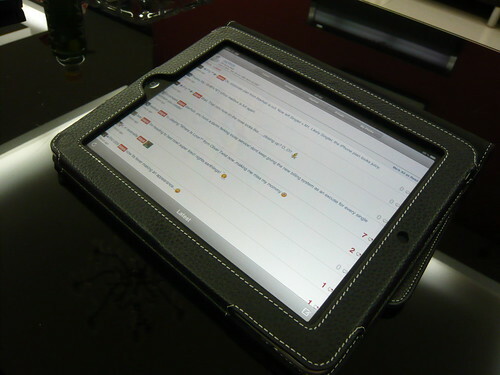 Now comes the iPad which fulfills all of the above and below are a few points of what I like I about it. I recently went on a business trip to Shanghai where I left my laptop behind and brought the iPad along to see if I can survive with it alone. It passed with flying colours. It is light and portable, making going through the airport security somewhat less clumsy. With everything (wallet, phones, coins, etc in the carry-on bag), it's just a bag, an iPad and me. Going through security was actually easier. I remember the early days where every available minute on the road is spent preparing spreadsheet after spreadsheet, presentation slide after presentation slide, pdf quotations after pdf quotations. A full fledged laptop was required. But now that I am at the stage (for quite some time already) where I have amassed my personal army within the organisation to do all that for me, I just needed something that fulfill the function of a read-only device. I have paid my dues churning out stuff for my bosses to look good in front of the board. Now it's my turn to be pampered. I use FileApp (Free) to fulfill this function. Back to the good old days of the Palm OS where we don't have to endure the dumbass boot-up eternity of Windows. For fellow Windows users, a way to get around this is not to shut-down the laptop. I never do. Instead, I put it to sleep whenever I go offline. With the laptop so intertwined with our daily lives, it is only a matter of a couple of hours before the laptop is opened up again to see the light of day. So why bother to shut down? My last laptop was the IBM Thinkpad X40 Tablet and my present one is the HP Touchsmart TM2. Both are big touchscreens. Size does matter which is why I resisted moving to the iPhone from my trusty Nokia E90, even though the latter is not touch-screen. Granted that the iPhone has a rather generous screen for a mobile phone but mind you, once the on-screen keyboard comes up, there is very little real estate left. At one point in time, I did consider the Fujitsu P-series as my choice for a laptop simply because you can swap out the DVD drive and put in a second battery to give you a total of 11 hours of juice, on top of the fact that it has a touch-screen. Problem is that batteries are not light. As if one is not heavy enough, you now have 2. That would certainly put the laptop over 2kg. Bad for the shoulders especially carrying them for prolonged periods of time. Point to note, your laptop weight must include the accessories that you intend to carry with you. The second battery, the external DVD drive, the mouse and of course the super heavy power brick that you can't survive beyond 4 hours without. With the iPad battery life rated at 10 hours, you can leave the power brick, albeit a tiny one back at the hotel or check-in luggage. There is no second battery and hardly any peripherals, the total weight is as close to the iPad weight as possible sans perhaps the protective carry cover. As much as I gushed about the iPad, there are some parts of it that I am unhappy with. Stay tuned for the next entry where I shall talk about them in greater detail.